Whether you know it or not, you’re in a fight for the health of your mouth, teeth and gums. Little troublesome bacteria are lurking in every particle of food you eat. Thankfully, there are tools available for you to defend the honor of your dental care. Your dentist in Indianapolis says that flossing is one of your major allies. Flossing is a powerful tool for dental care because it boldly goes where no man has gone before – between the teeth, just under the gum line. This is major because these areas are where the little harmful bacteria insurgents like to hang out. They bank on you neglecting to seek them out, because you’re too busy to floss or just don’t do it thorough enough. When you eat, the food particles left in your mouth become your worst enemies, as bacteria feed on them and can eventually bore holes into the teeth, which is what your dentist calls cavities. When you floss you remove these particles, which blocks the harmful growth of bacteria. Reports Lacking Evidence – Recently, the Associated Press reported that “there’s little proof that flossing works.” The article goes further to suggest that dental floss companies are receiving preferential treatment because they pay fees to the American Dental Association for the latter to continue to recommend flossing as a key component in maintaining optimum dental health. Waterpik – Another myth is that the waterpik works better than flossing. The claim is that its pulsating heads help to remove biofilm from the teeth, giving it an advantage. 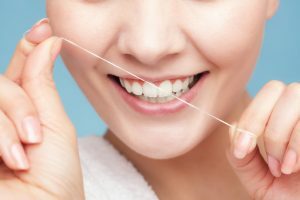 A counter prospective is given in the Journal of Dental Hygiene, which provides data showing how flossing is integral in reducing gingivitis at one, three and six months intervals. The difference between the arguments involving flossing and the waterpik is data. Data prove the effectiveness of flossing, but there are none backing the claims of other modalities, like the waterpik to work better. When you don’t floss you are vulnerable to gingivitis and cavities. And flossing is one of the most efficient ways of getting into difficult places to remove harmful bacteria. According to Clinical Microbiology Reviews, there are over 1,000 bacteria in dental plaque. The bacteria can irritate gum tissue, causing it to become red, inflamed and bleed easily. The great dilemma with these myths is that in trying to disprove the necessity of flossing, they shine an unfavorable light on their inabilities to properly remove plaque from gum lines and prevent gingivitis. A better approach would be to find ways that other modalities can work in conjunction with flossing to fight the real enemy – plaque buildup. Until data-driven evidence is provided proving otherwise, continue to brush and floss your teeth twice a day, and make sure to get in to see your dentist twice a year to ensure your optimum dental care. Dr. Mark M. Farthing has been restoring smiles since 1982. A graduate of the University of Northern Colorado in Greeley, and Indiana University School of Dentistry, he practices at Indianapolis Family Dentistry, and can be reached for more information through his website.